Rolls-Royce has unveiled the Bergen B36:45 model, its latest in a series of liquefied natural gas (LNG) fueled marine engines, at the SMM maritime exhibition in Hamburg. Power output of the LNG-fueled B36:45 engine is identical to that of the liquid-fueled B33:45 at 600kW per cylinder at 750 rpm. Specific energy consumption is a low 7300kj/kWh mechanical ISO including two engine driven pumps; specific lubricating oil consumption is less than 0.4g/kWh. 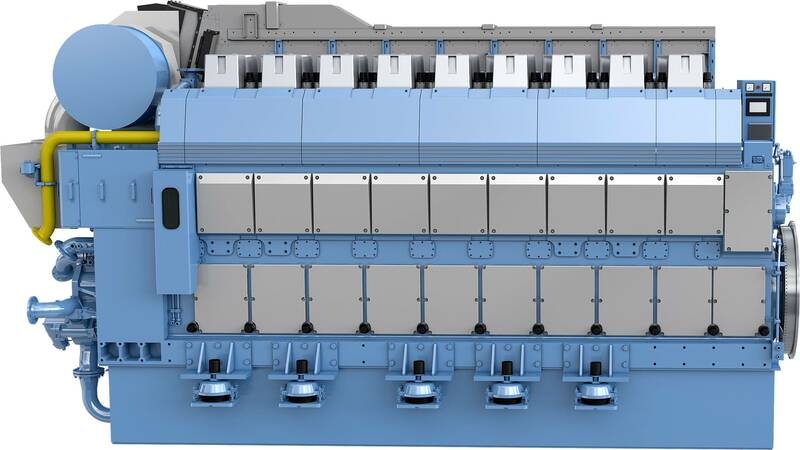 The B36:45 is available in six, eight and nine-cylinder in-line configurations. A V-12 version is now in development, which will be followed by a 20-cylinder V-engine for very high-power applications. The proven lean-burn Otto cycle combustion B36:45 technology has been developed during Bergen Engines’ extensive experience with LNG-fueled engines so that methane slip, which contributes to greenhouse gas emissions, has been minimized. “This new engine builds on the success of the Bergen B35:40-series engine and offers a variety of new benefits to our customers, including rapid response to changes in load and speed, high reliability and clean burning,” according to Kjell Harloff, Rolls-Royce Commercial Marine, Senior Vice President – Engines. The latest Bergen gas engines are able to achieve up to 22 percent lower Green House Gas (GHG) emissions than the equivalent diesel-fueled version, the manufacturer said. “As most LNG is sulphur-free fuel, sulphur oxides (SOx) and particulate matter emissions are virtually eliminated, while emissions of nitrogen oxide (NOx) are reduced by over 90 percent compared to an equivalent diesel engine. This means that the Bergen B36:45 is able to meet IMO Tier III and EPA Tier 3 emission levels without the need for additional selective catalytic reduction (SCR) systems,” Harloff explained. In the case of the new B36:45, the main structural components are the same as those used in the B33:45-series liquid fuel engines. The crankcase, common to all engine types, incorporates all air and oil galleries, minimizing external pipework and ensuring stiffness and operational safety. Individual cylinder heads and three-piece connecting rods allow the complete head, liner, piston and upper conrod to be withdrawn for overhaul and replaced, as an assembly, without disturbing the engine bottom end. For the gas version, different liners, pistons and heads are employed, giving a 30mm increase in cylinder bore compared with the existing, well-proven, liquid-fueled B33:45. The stroke remains unchanged, at 45cm. Other changes involve the fuel system and injectors, which are Bergen Engines’ own design and make for reliable operation with gaseous fuels. The robust variable valve timing system allows optimum response to load changes, regardless of the grade of fuel.